I still had a lot of phyllo dough left over after making the zucchini pie and I knew just what I wanted to use it for. Not too long ago I came across the concept of an artichoke pie on Kali Orexi and given my new found appreciation of artichokes I could not resist making one. I pretty much just took the zucchini pie’s recipe and replaced the zucchini with artichoke hearts. I used canned artichoke hearts as that is what I could find but feel free to use frozen or fresh if you prefer. Working with phyllo dough is getting easier the more that I use it and this pie came together quite easily and it turned out great! The phyllo was a nice golden brown, light, crispy and flaky and good. The artichoke hearts worked really well in the pie and I enjoyed the freshness and flavour that the herbs added. I don’t really think that you can go wrong with these vegetable pies with the feta and herbs all wrapped up in flaky phyllo and I look forward to experimenting with more versions. Mix the artichoke hearts, feta, herbs, green onions, eggs, salt and pepper in a large bowl. Brush the top of a sheet of phyllo dough with olive oil and place it in the pan. (You may have to cut the phyllo dough to fit the pan.) Repeat until you have 6 layers. Place the artichoke mixture on top of the phyllo dough. Brush the top of a sheet of phyllo dough with olive oil and place it on the artichoke filling. Repeat until you have 6 layers. everything in here is a – yumyumyumyum! This looks delicious. I love artichokes and Greek foods. Great creation! Artichokes are readily available at the farmers market now and this looks like a wonderful way to use them. Love feta cheese and all the fresh herbs. That pita must have a refined taste! Delicious looking! I've been lurking on (and loving) your blog for a while, but couldn't pass up leaving a comment this time. Wow, what a great idea. This looks wonderful and I can't wait to give it a try. This is my favorite type of savory pie! I love spinach and artichokes. Perfect! That is right up my alley, beautiful! Greek style pies are such a treat. LOVE it. Feta and artichokes are so delicious together — the sweet/salty combo is win/win!! I love using phyllo pastry for pies, because it does not steal the show from the filling and in this case those delicious artichoke hearts are truly showstoppers!!! My husband adores artichokes and this recipe looks like it would be a huge hit. Off to find phyllo dough! Oh! The artichoke pie looks so tasty…absolutely delicious! My mother is obsessed with your blog and recipes! I got two emails from her over the weekend with delicious recipes from you! This sounds lovely Kevin! My daughter especially loves artichokes! Cheers! Anything with phyllo will take the cake. Sounds totally delicious. What do you do with the eggs? And is there spinach missing from the ingredient list??? You're on a roll with the phyllo dough. Nicely done. I need to get me some artichokes. I love the stuff, but ever get around to getting some myself. Yum!!!!! What a unique idea. Great use of the artichoke…a new spin. Delicious! I just love artichokes and the idea of them hidden in a flaky crust with feta and herbs sounds wonderful. Thank you for sharing! 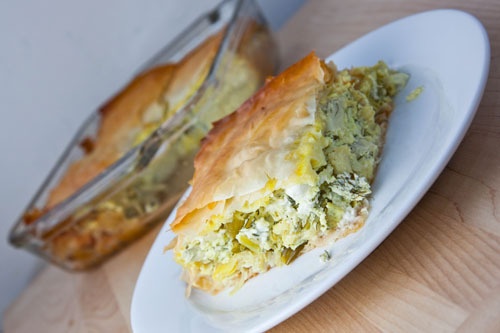 Love the idea of phyllo and artichoke! I love your love for Greek food and sharing it with us. Looks de-lish! This looks great! I just started my own cooking blog. I added you to my blogroll! I just opened up a can of artichoke hearts for dinner tonight, but only used a few and wondered what I was going to do with the rest. This would be perfect! it is a struggle for me to us filo (not breaking it) that looks really crisp! This dish had me at "hello" Kevin. You are really loving phyllo dough huh? Anonymous: That's what I get for copying and pasting the spinach pie recipe to start… I did not use any spinach in this recipe though you could easily add some if you like. The eggs go into the artichoke filling and work as a binder to hold the filling together. I have cleaned up the recipe. Thanks! Looks wonderful and like a great summer lunch! Mmm delicious variation on spanakopita!! Wow. This looks absolutely delicious. I love artichokes but I'm not too savvy with phyllo yet. I may have to give it a whirl! So very very tasty! This recipe is a keeper!